Don't flirt with Tories on EU! London students need a union! 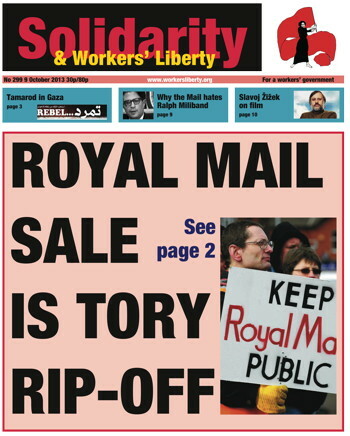 Royal Mail: Keep it public! Fight on the principle! As of 8 October, only 155 people seem to have survived the wreck of a small boat in which Somali and other migrants were attempting to reach Italy from Libya. The boat sank just off the coast of Lampedusa, a small Italian-owned island in the middle of the Mediterranean, between Sicily and Tunisia. It is reckoned to have had over 500 people on board — over 25 for each metre of its 20-metre length. 232 bodies have been found so far. Just a day before the boat sank, the Council of Europe condemned the immigration policy of the Italian state. Right-wing Tory backbencher Adam Afriyie says that in mid-November he will force a vote in Parliament over an in-or-out-of-the-EU referendum in 2014 by tabling an amendment to a private member’s bill calling for a referendum in 2017. Former Labour Party chair Tom Watson says he may support Afriyie. The Labour front bench previously said it would back a referendum only when there’s a big shift in British-EU relations. Now it says it will “make a decision when it sees the text of the amendment”. University of London (UoL) bosses want to shut down the University of London Union (ULU), the cross-London student union. There are essentially two factors here: one to do with the ideological agenda of university managers and the weakness of the student bureaucracies, the other to do with the fate of the University itself. The Defend The Link campaign meets on 9 October to plan its campaign up to the Labour Party’s special conference, probably on 1 March 2014. Its aim is to defend the trade unions’ collective political representation within the party. In July, in the wake of the now-discredited charges against the Unite union of malpractice in the Falkirk Labour Party, Labour leader Ed Miliband called for trade unionists to be counted out unless they individually "opt in". Junior doctors in the Republic of Ireland Ireland held a one day strike on 8 October over long working hours. Three thousand doctors took part and fifty-one hospitals were affected. Junior doctors are routinely required to work individual shifts of over 24 hours at a time and up to 100 hours a week. The Irish Government has admitted that the hours worked are in breach of the European Working Time Directive. The doctors' strike follows weeks of failed negotiations with the Irish health service. NUT and NASUWT members in Yorkshire, the Midlands and parts of eastern England struck on Tuesday 1 October in opposition to Michael Gove’s attacks on education. As well as making changes to the curriculum with no staff consultation, Gove has been attacking teacher pay, notably through the removal of the national pay scheme, and a less-than-inflation 1% pay rise in 2013, as well as demanding teachers work longer hours, retire later, and for a smaller pension pot at the end. 2500 schools in 49 authorities were closed in total. The Government has called on NHS pay review bodies to abandon a planned 1% rise in pay for 1.3 million NHS staff. They say that the rise — which is below inflation and conforms to the Government’s own policy of public sector pay restraint — is unaffordable. It is due to be implemented from April 2014, after two years of pay freeze and attacks on healthworkers’ pensions. Paul Dacre, the Tory editor of the Daily Mail, is over-confident and nervy. So much so that he launched and has stuck to a claim that Labour leader Ed Miliband secretly pursues “the vision” of his Marxist father Ralph Miliband, who was “the man who hated Britain”. Often, usually, the Tories keep their support by presenting themselves as the safe, cautious option. They are the people with the expertise and habit of command to make cuts when necessity drives.